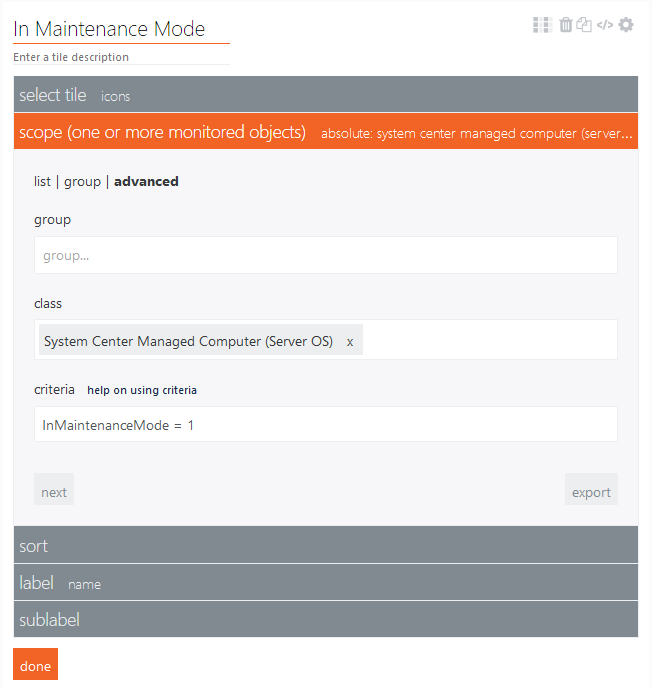 Has anybody ever created a dashboard to show what is in maintenance mode. I was thinking that might be a good one to set up so people can know what is being worked on. Any tips on how to do this. Hello. This dashboard is exactly what I was looking for, but unfortunately I cannot get it to work. Whenever I try to execute the SQL query against my DB, I get a bunch of errors. I have also tried to execute it directly in the SQL Management Studio, this doesn't work either. I haven't done any modifications to the SQL query at all. I'm on SCOM 2016. I am getting the errors stated below - can anybody tell me what I am doing wrong? Msg 102, Level 15, State 1, Line 3 Incorrect syntax near '‘'. Msg 102, Level 15, State 1, Line 4 Incorrect syntax near 'time'. Msg 132, Level 15, State 1, Line 10 The label 'Hardware' has already been declared. Label names must be unique within a query batch or stored procedure. Msg 132, Level 15, State 1, Line 11 The label 'Hardware' has already been declared. Label names must be unique within a query batch or stored procedure. Msg 132, Level 15, State 1, Line 12 The label 'Hardware' has already been declared. Label names must be unique within a query batch or stored procedure. Msg 132, Level 15, State 1, Line 14 The label 'System' has already been declared. Label names must be unique within a query batch or stored procedure. Msg 132, Level 15, State 1, Line 16 The label 'Application' has already been declared. Label names must be unique within a query batch or stored procedure. Msg 132, Level 15, State 1, Line 17 The label 'Application' has already been declared. Label names must be unique within a query batch or stored procedure. Msg 132, Level 15, State 1, Line 18 The label 'Application' has already been declared. Label names must be unique within a query batch or stored procedure. Msg 132, Level 15, State 1, Line 19 The label 'Application' has already been declared. Label names must be unique within a query batch or stored procedure. Thanks I was getting stumped on the criteria I wish I could find a document out there that would show me what my options are there. We have an icon tile that is configured like this. We use this method also, works great.